The poor state of the HF bands as well as very limited coverage using the 2m bands mean that the RHA is taking a break until the middle of 2019. Stories and legends about Robin Hood are popular around the world, especially the USA and in Europe, so this award offers an opportunity for Radio Amateurs to share their interest in these tales - and the "real" history - on air. The Robin Hood Award is an 'self-service award' for Radio Amateurs who make radio contacts into, or out of, Robin Hood Country' in Northern England. All Radio Amateurs can participate, and the award is totally self-regulated by participants. The Award has two categories: 'Chasers' and 'Activators'. The award is free and the rules are not complicated. New award levels were added in January 2018 response to demand, and include Special Awards which will be offered periodically. Just 4 contacts are needed to claim the first main awards - more details > here <. Robin Hood Country covers a very large part of Northern England according to both the original ballads (called 'gestes') and the historical context of anti-royal and anti-monastic dissent in the early Middle Ages. Please see the map (here) for the area covered. There are also places with Robin Hood associations - including street and 'pub' names to townships, hills and caves - all around Britain and other parts of the world: most can qualify. The rules are quite simple - mainly common sense applies. It is most probable that the original Robin Hood was a fictional character, and the tales are almost certainly based on an the exploits of several outlaws roaming Northern England in the 13th Century . Many of the stories (compiled centuries later) place Robin Hood's activities in south Yorkshire and north Nottinghamshire, and there are strong - if controversial - claims for him being a Yorkshireman. For a little more 'history go to the Resources Page. Many places named in the tales do exist, although many lie outside Sherwood Forest. Indeed, Robin Hood was known to have visited many other parts of the world, notably Hollywood, CA., and was eventually buried in the USA by the Disney Corporation in 1973. A list of Notable Robin Hood Locations (with WAB/National Grid 10km Squares) can be found at the bottom of this page. There are links to more sources of information on the Resources page. Please note: these are suggestions not activations. It is now generally accepted that Robin Hood was a Yorkshireman rather than from Nottingham, and the earliest ballads describe places spread far and wide across Northern England well beyond the bounds of Sherwood Forest. The 'North Country' of England and the adjoining Scottish Borders were places where outlaws flourished. But they were also places far from the King's authority and where the King and the monasteries owned vast 'private' estates. These were all causes for resentment, and many of the North Country folk tales and songs have similar themes to the Robin Hood Legends. There are many specific locations closely associated with Robin Hood and mentioned in the early ballads and 'gestes'. So, we can 'define' the areas which qualify for the Robin Hood Award quite widely. This map covers the area in which the RHA will operate (click for the full size view). The areas included are: The Peak District; Nottinghamshire; most of Yorkshire; Derbyshire; Sherwood Forest; Charnwood Forest; the Forest of Bowland; Yorkshire Dales; North York Moors. Many places in theses areas feature in the early Robin Hood ballads and tales, although the later romanticised stories (books, comics, cartoons and films) only focus on Nottingham and Sherwood Forest. There are also many named localities associated with Robin Hood in other parts of the UK and even elsewhere in the world: these too qualify for the award. 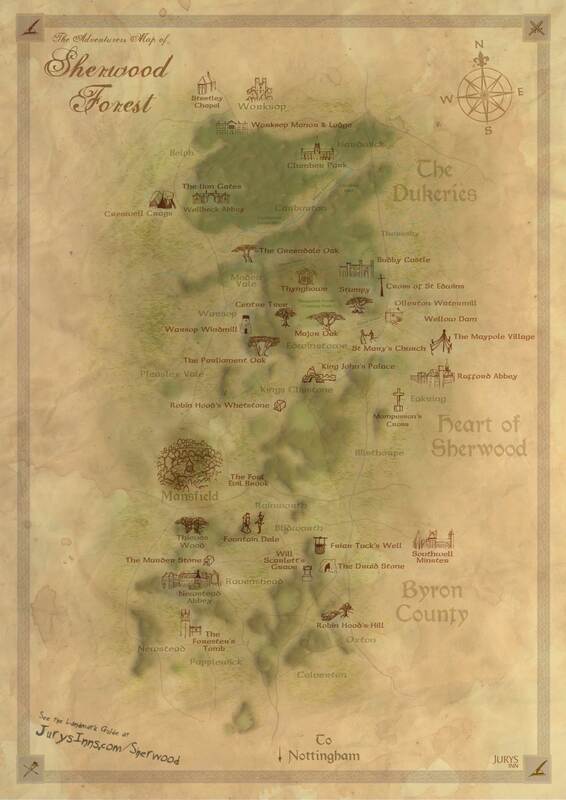 This map, designed for Robin Hood fans, shows many of the places in Sherwood Forest which appear in tales about Robin Hood. Click on the map to go to a fully-featured 'Jury's Inn' website about Robin Hood Country (open is a new window). There are many other places that may have associations with Robin Hood. Robin Hood's Cave Derbyshire SK 243 835 SK28 Stanage Edge Footpath. Roadside parking 1km S.
Robin Hood's Grave West Yorkshire SE 174 215 SE12 3km NW of Mirfield (A644). 100m NE of road Private land, permission essential.